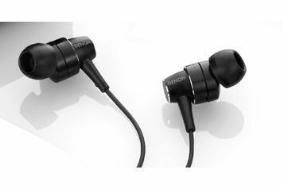 Denon AH-C710 in-ear headphones major on comfort | What Hi-Fi? A newly developed radial cascade damper is said to "dramatically reduce cable transmitted vibration noise that occurs when touching or rubbing the cable while moving". There's a new hybrid housing using a combination of elastomer (soft plastic) and aluminium, and a specially designed acoustic optimiser "that ensures dynamic sound and deep, rich bass response". As if that's not enough, you also get small, medium and large soft-foam ear-pieces that mould to the shape of your ear canal, an 0.8m extension cable and a carry case with built-in cable management. Oh, and adjusting sliders for a more comfortable fit. The Denon AH-C710 headphones are available now in silver or black for £140.